Alaska. The name conjures up images of a cold remote region, of totem poles, icebergs, glaciers, snowy mountains, salmon bear, moose and whales. The name Alaska is probably derived from the Aleut word agnualaksh, which means ‘the shores where the sea breaks its back’ ( Corey Ford) . But planning a trip to Alaska was not easy. The information available was staggering and informative websites such as alaska.org provided rich introductions to any adventure. There were detailed sections on every part of Alaska, from the well known Denali National Park and Mt McKinley and Prince William Sound to ones I had never known of before such as the Chugach and Talkeetna mountains. From salmon fishing to kayaking, to watching bear and flying in a sea plane to a remote lake, Alaska offered a rich array of exciting opportunities to immerse oneself. Of all these an exciting range, close to Anchorage seemed to offer it all. 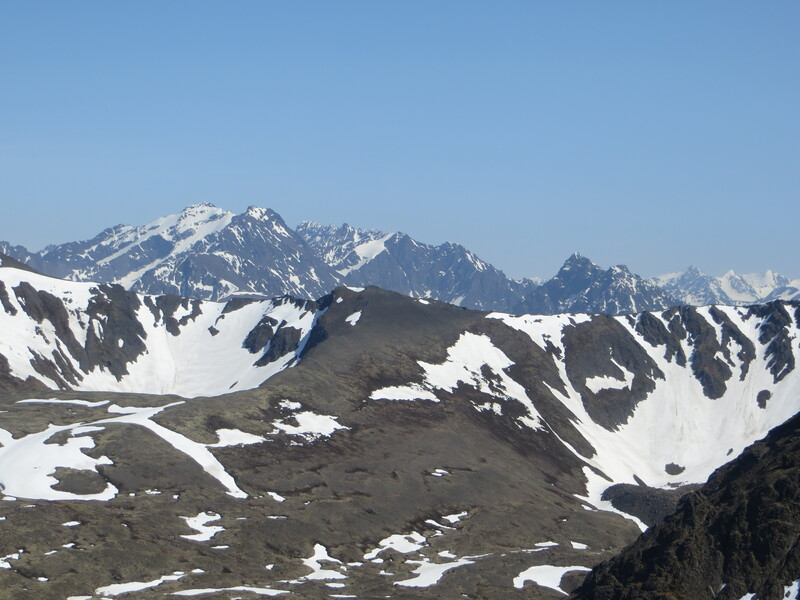 The Chugach Mountains. 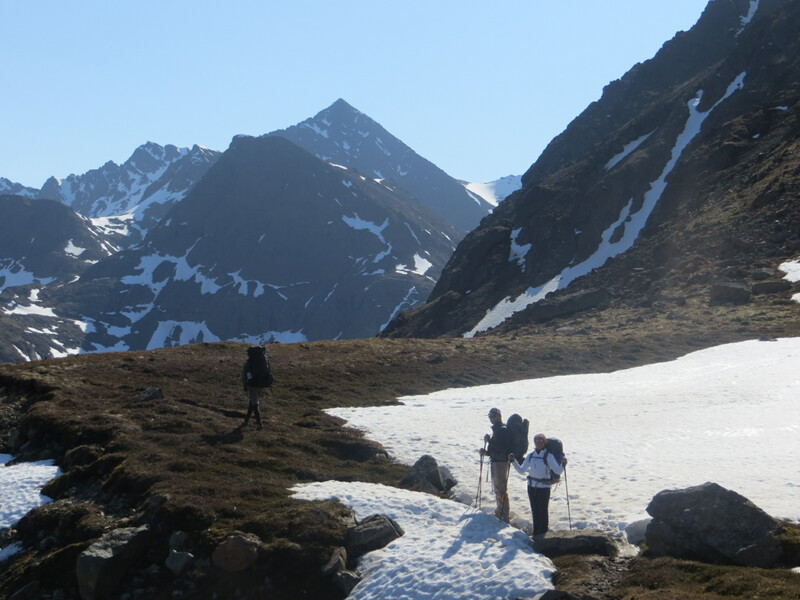 The Chugach Mountains of southern Alaska are the northernmost of the several mountain ranges that make up the Pacific Coast Ranges of the western edge of North America. 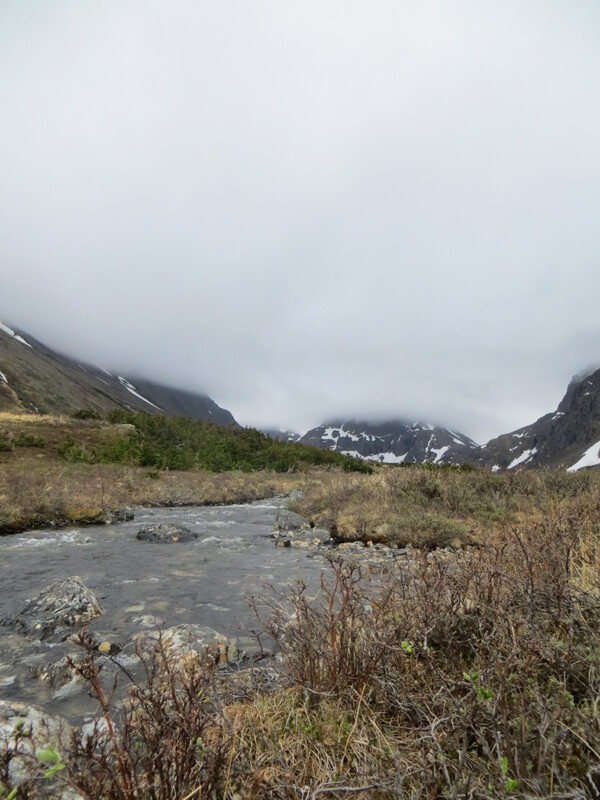 The range is about 250 miles (402 km) long and 60 miles (97 km) wide, and extends from the Knik and Turnagain Arms of the Cook Inlet on the west to Bering Glacier, Tana Glacier, and the Tana River on the east. It is bounded on the north by the Matanuska, Copper, and Chitina rivers. 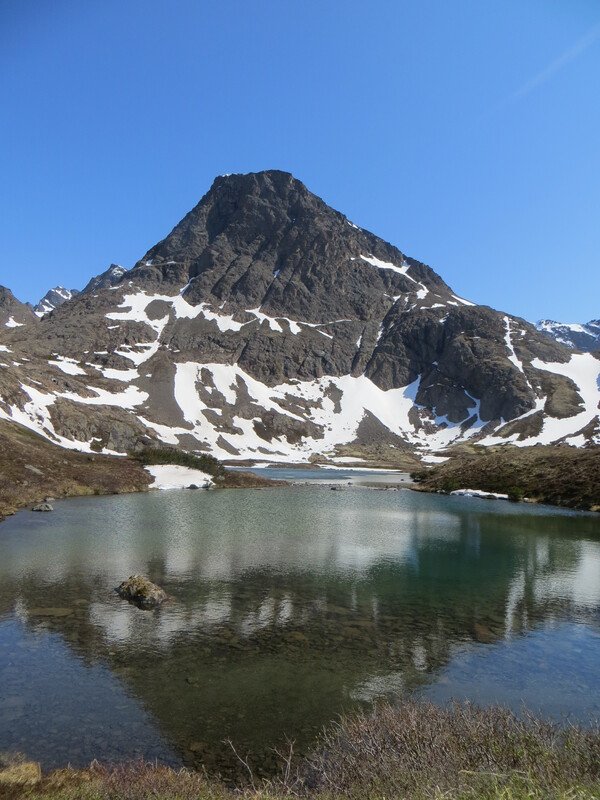 The highest point of the Chugach Mountains is Mount Marcus Baker, at 12,884 feet (3,927 m), but with an average elevation of 4,006 feet (1,221 m), most of its summits are not especially high. 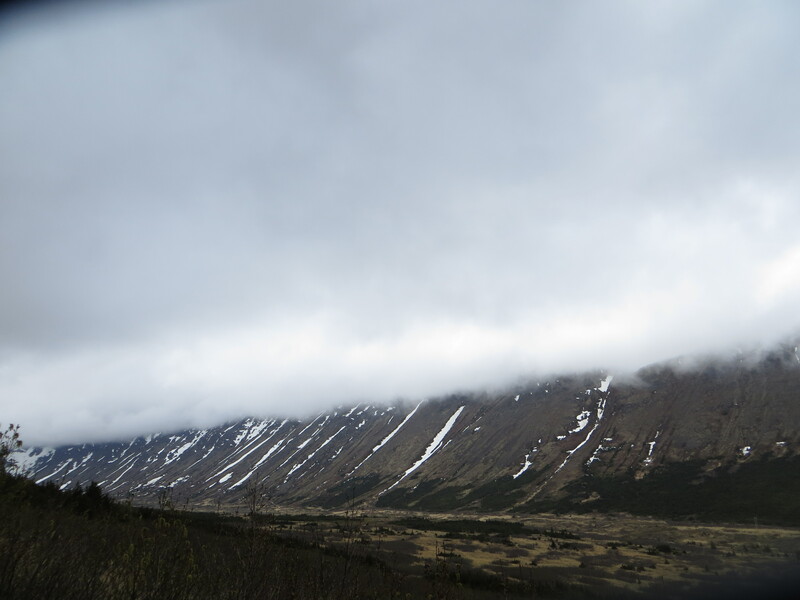 Even so its position along the Gulf of Alaska ensures more snowfall in the Chugach than anywhere else in the world; an annual average of over 1500 cm (600 in). The name “Chugach” comes from “Cuungaaciiq” meaning “Cook Inlet”; Russians applied this name to the indigenous Sugpiaq or Alutiiq people of the southern Kenai Peninsula and Price William Sound. 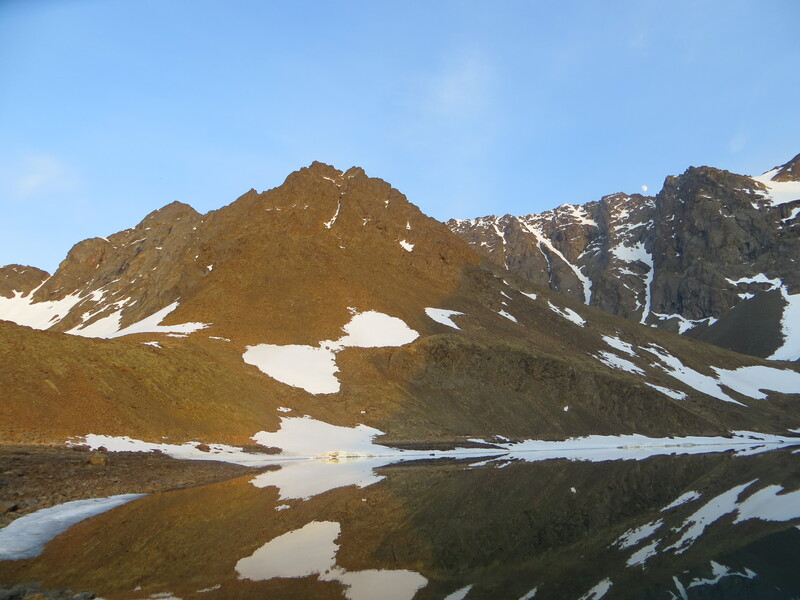 So, when I chose to explore Alaska’s wilderness and remote regions, I first headed to these epic and astonishingly beautiful mountains that had captured my imagination many years ago. 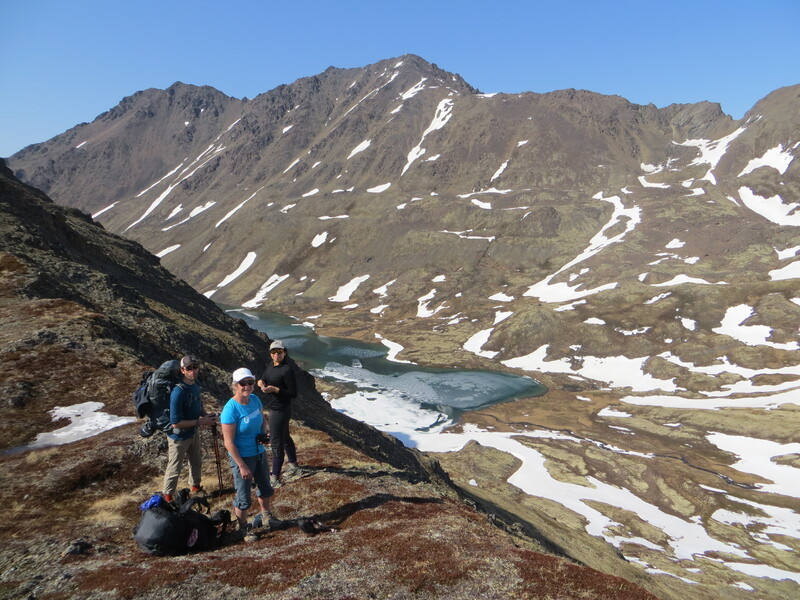 The backpacking expedition was organised by Alaska Alpine Adventures, a thoroughly professional outfit with trained and experienced alpine guides – Haley and Malcolm. And our group had 4 other backpackers from some other parts of the world – Lea, Cody, Yazmin and Lindsay. Overall a small but interesting , friendly and very fit group. 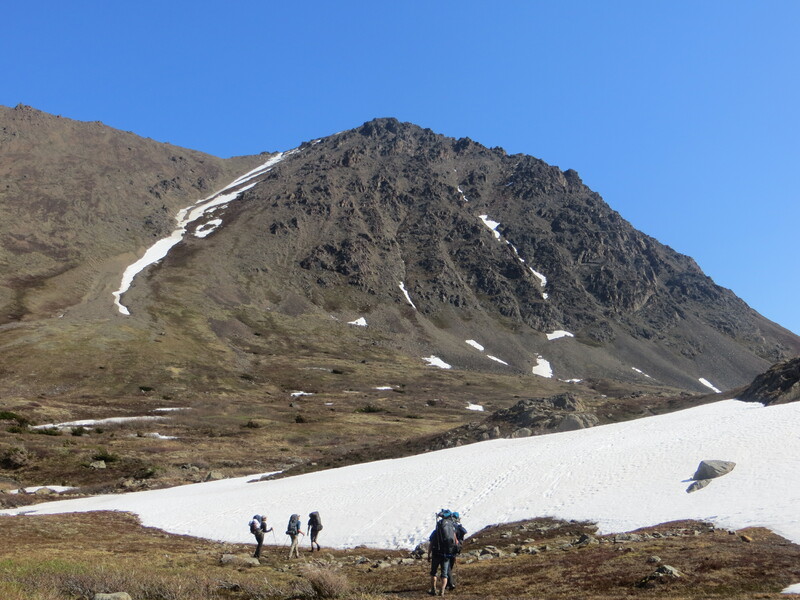 Day one began with a march towards the entry into the Chugach State Park which is the second largest in the U.S., and thereafter began a vertical and tough steep ascent which had us struggling with our heavy backpacks. 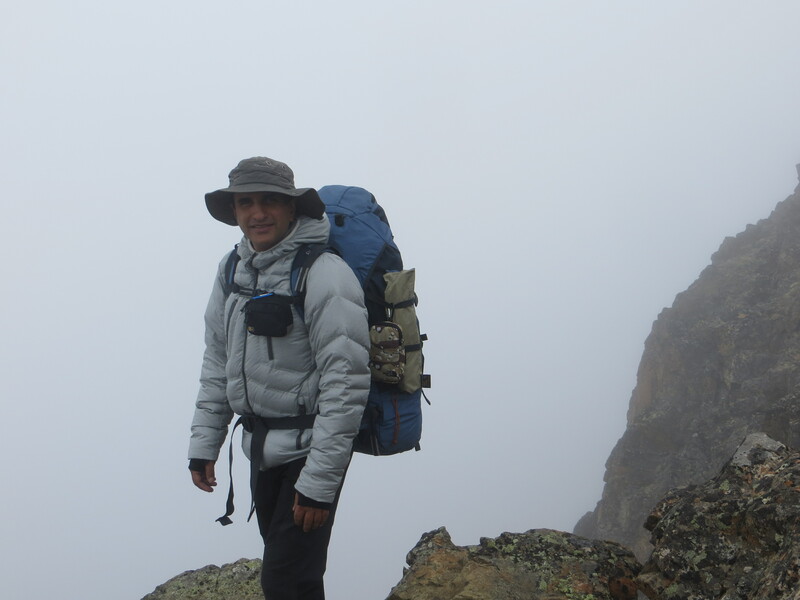 Our backpacks had been checked by our guides, as they have to be packed right and to the right weight, since one is carrying food for 4 days, all ones own gear including a tent, and whatever that is needed to survive on ones own for the duration of the trek. Inspite of removing some items seen as “extra” , my backpack still weighed almost 15 kgs and now as we heaved up the mountain trail, I wish I had offloaded some more. Our food “barrel” was a cyclindrical high density plastic container that weighed 2 kgs and was “bear-resistant” . 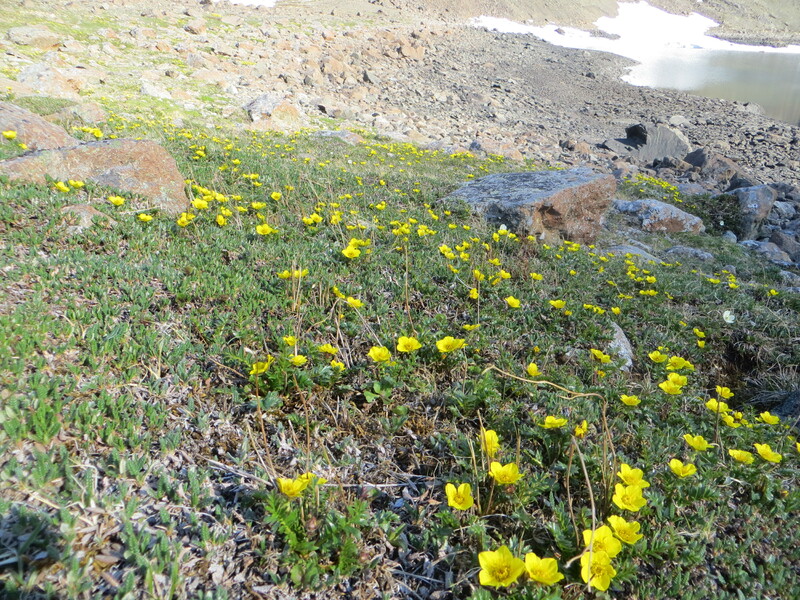 Food has to be packed in air tight containers so that the smell does not attract bears on the trail. Our guide, Haley, carried a handgun for our protection, though she said, in the six years she had been guiding in Alaska, she had to use it only once to scare off a bear who was proving to be threatening. 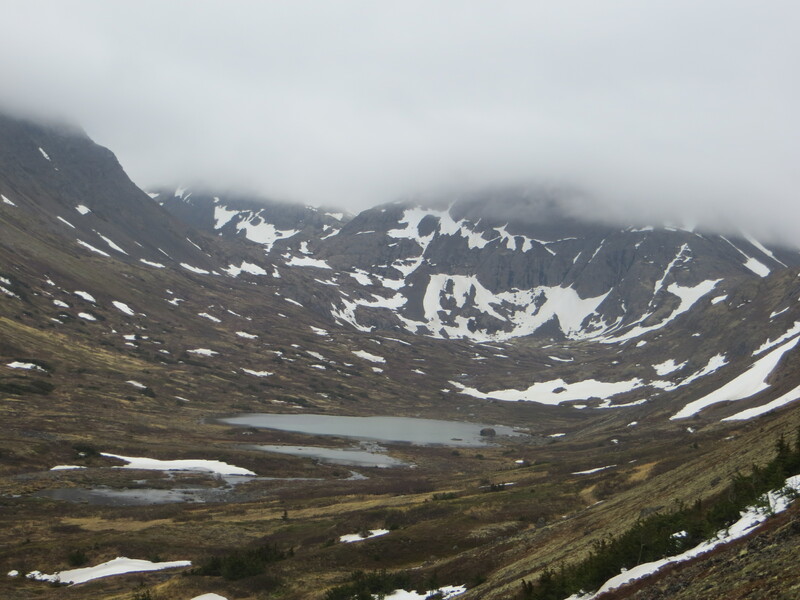 After 4 hours of climbing and traversing cliffs and sheer drops we began our descent to the valley below – to Black Lake. 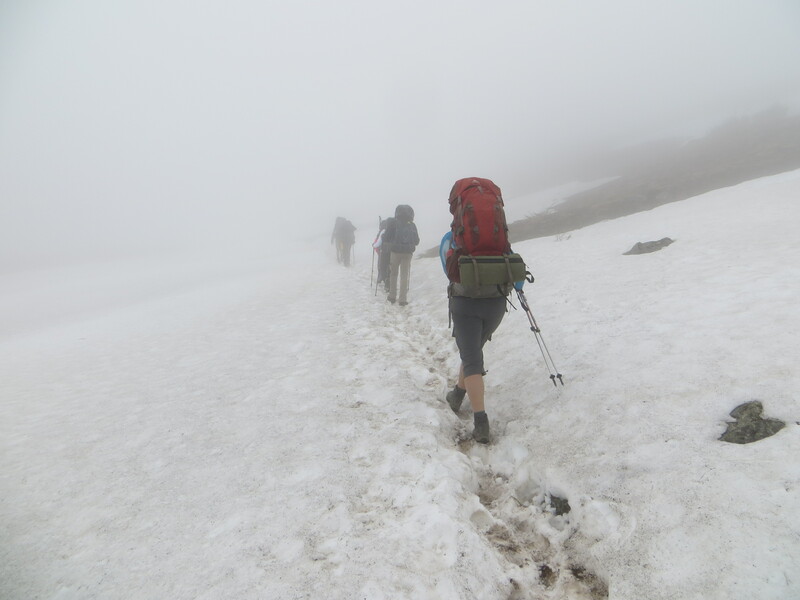 The descent was in thick fog, over sliding stones and loose mud and a steep slope, with nothing but our trekking poles to rely on. 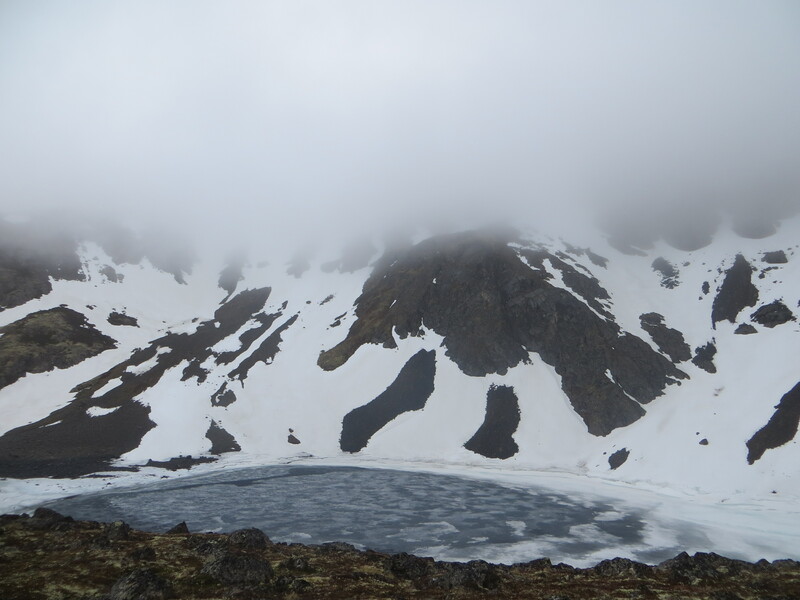 As we cleared the mist, we set our eyes on a sheer ice lake, flanked by snowy craggy peaks. It was like a protected pearl. Majestic and strange, at the same time, foreboding because its frozen waters were not white but dark grey because of the light I presume. We camped by the lake and refilled our bottles from its pristine waters. 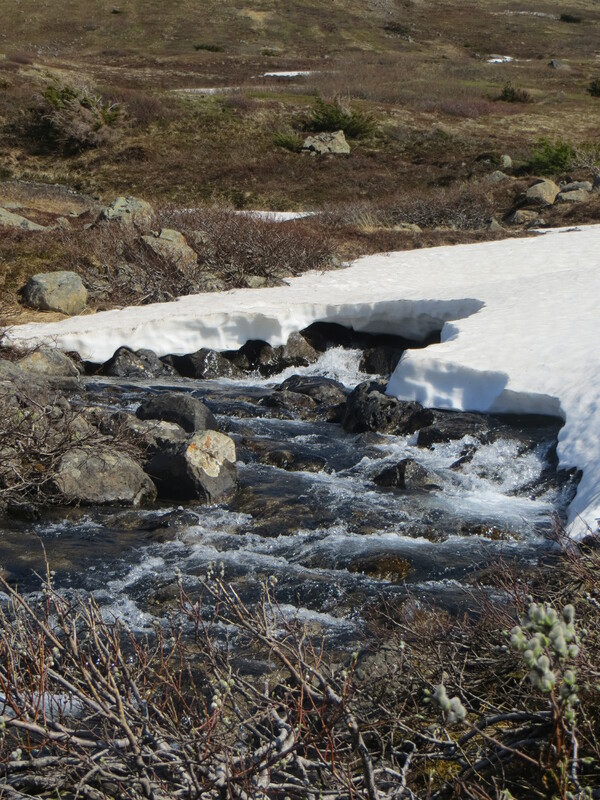 In fact, throughtout the four days of trekking, we drank off from creeks gushing with melting snow. Delicious cold water. Of course, Haley insisted on further sterilising the water with the advanced Steri Pen ( as moose or bear may have have drinking from upstream), an amazing piece of filtration technology that is pen sized and uses UV light to kill all harmful bacteria. The first night was cold and damp as the sky was overcast though it remained lit till 3am. 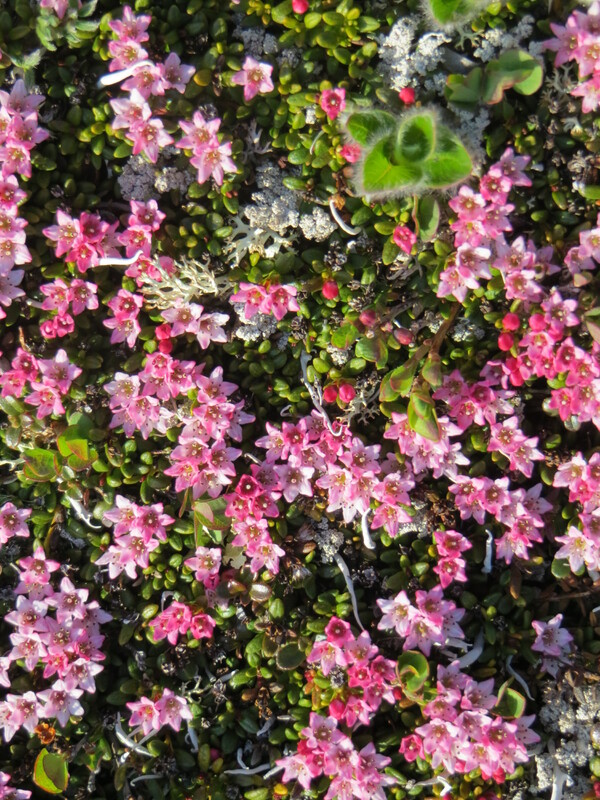 Our tents were pitched on soft moss and lichen of the tundra that provided great cushioning. The kitchen tent was erected simply on our trekking poles and some great food was made by Haley and Malcolm on the stove, from the specially dehydrated foods they were carrying. Food was followed by dessert – mainly chocolate cookies and warm cocoa with milk for those wanted it. Quite a luxury, when camping in the remote wild. While dining we could hear many birds, and some are unique to the Arctic, such as the golden crowned sparrow and the Ptarmigan (P is silent). 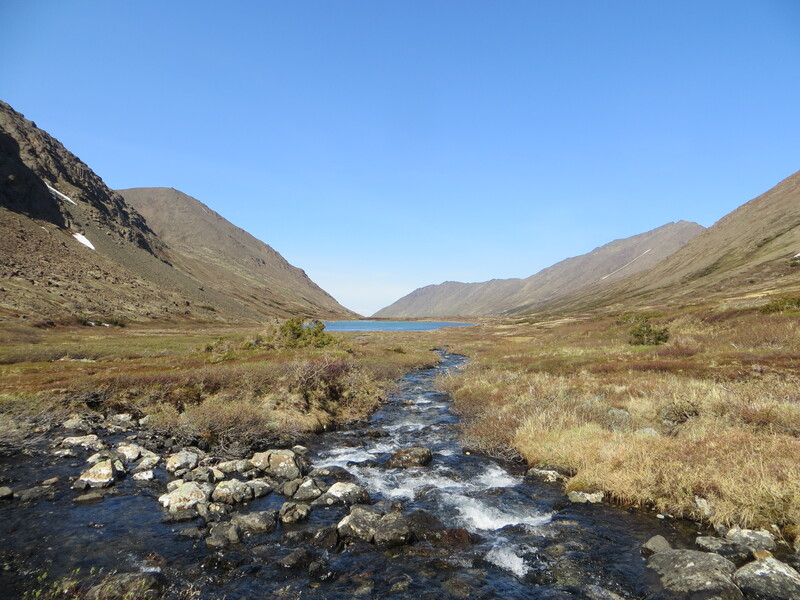 In the days to come, we would also see the grand Golden Eagle, and the exotic Harlequin duck. On the second day we were greeted by a beautiful warm sun that woke us from a deep sleep. Post a hearty breakfast of porridge we were off for the day after packing in our gear. We trekked from craggy cliff tops to overpowering and massive mountain mastiffs, standing tall at 3000 mts. I am wonderstruck at treading on acres of the soft, spongy and crackly moss and lichen, interpersed with lovely flowers such as the crow berries( like wine colored berries) , alpine lily, wild celery,shrubby cinqufoil ( small pretty yellow flowers) and looked forward to walking along them after long stretches of trekking on rocks and stones by the creeks. 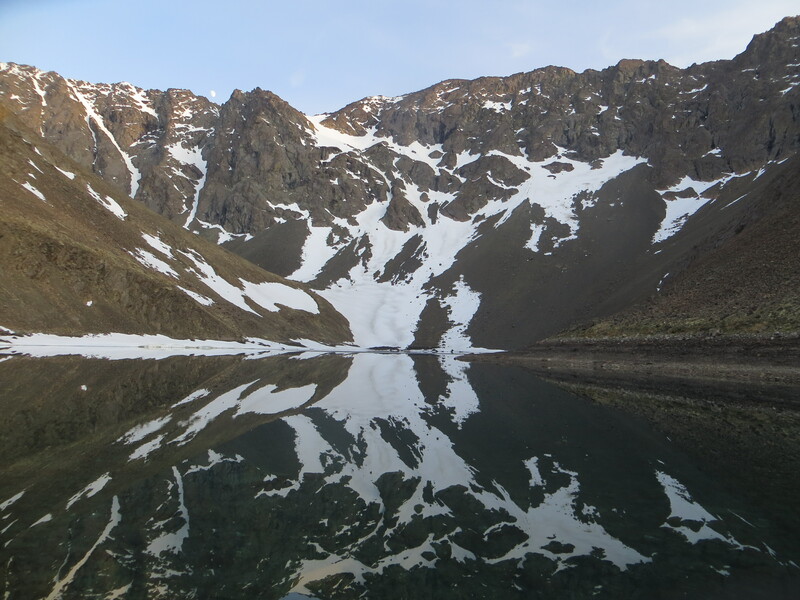 After climbing and traversing on steep mountainsides, and descending a sheep trail that was downright scary, we reached a mesmerising and beautiful lake called Long Lake at the base of Mt. Williwaw . An uninspring name but nonetheless breathtakingly scenic. We set up camp here, amidst an awesome view of snowy peaks and a lake that glinted like gold in the long rays of the sun. 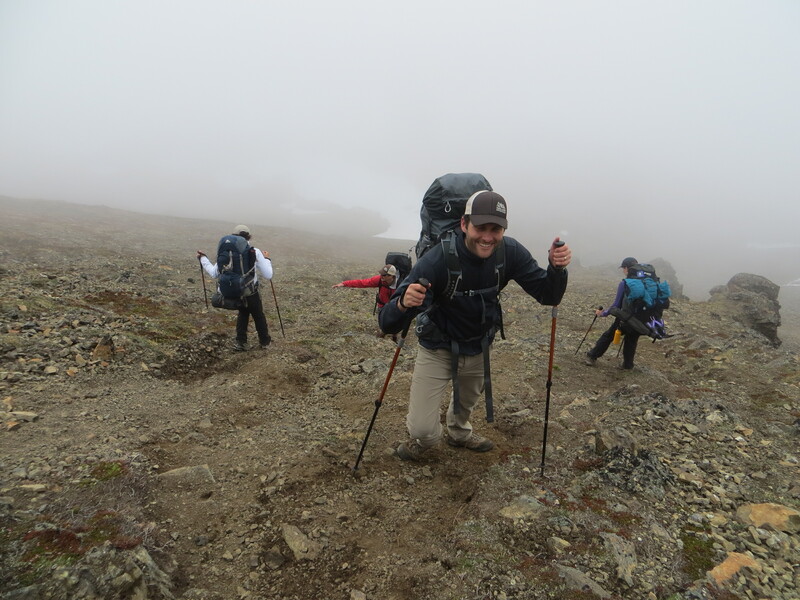 Much like most US parks, the Chugach State park allows no campfires and most professional outfits have processes that strictly follow the Leave No Trace principle. No wrappings, cans, or toilet paper or food of any kind can be left behind. These practices make the experience even more real, as there really was no trace of humans on any of the days we were trekking, except for a military observation post. Day Three started late, with the morning Arctic sun, searing down, prompting most of us, to strip down to just a layer or two. With no pressure of darkness at the end of the day ( and a time limit of 5 pm to set camp for the night while in the Himalayas) , in Alaska, with almost 22 hours of daylight, we could leave camp leisurely. 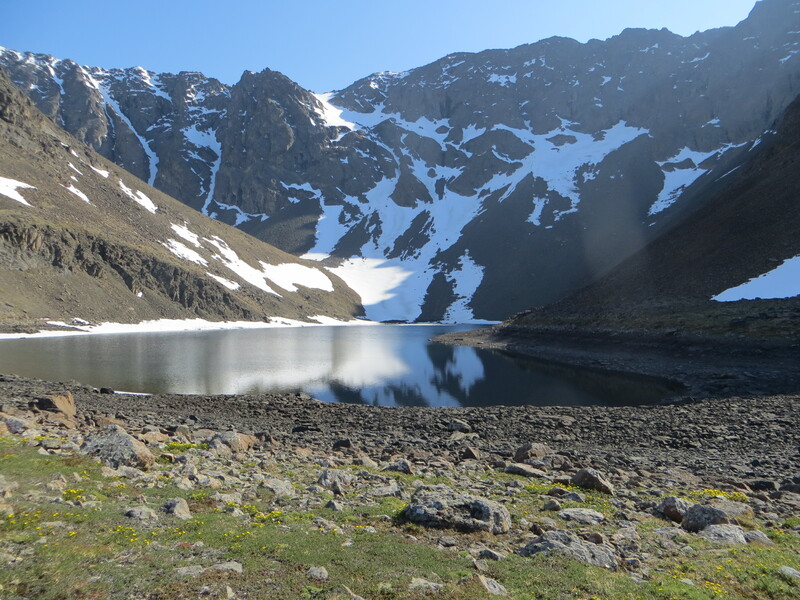 We trudged and climbed on boulders, rocks and stones for more than an hour, along the lake, and then climbed a short ridge, to begin our tough 2 hour long traverse by the mountain side, turning right to climb a steep slope to a pass that would enable us to reach the next valley. The left ankle took a huge strain, as it was taking the entire body weight while traversing. Yet the beauty of the views of the valleys below and the mountains on either side, alongwith the high winds that cooled us, took the mind off the ruggedness of the climb. High up in the crystal blue skies, golden eagles glided in the wind currents with luxurious ease, their hawkish eyes peeled for game such as a baby Dall sheep. On reaching the ridge, Haley and Malcolm set off to find a suitable path to descend to the valley below. We were off the trail and it was sheer excitement. They returned in some time, only to tell us that the only way down was the 60 degree slope right in front of us. We looked down in disbelief. “That way ? No way !” That was the first natural response. 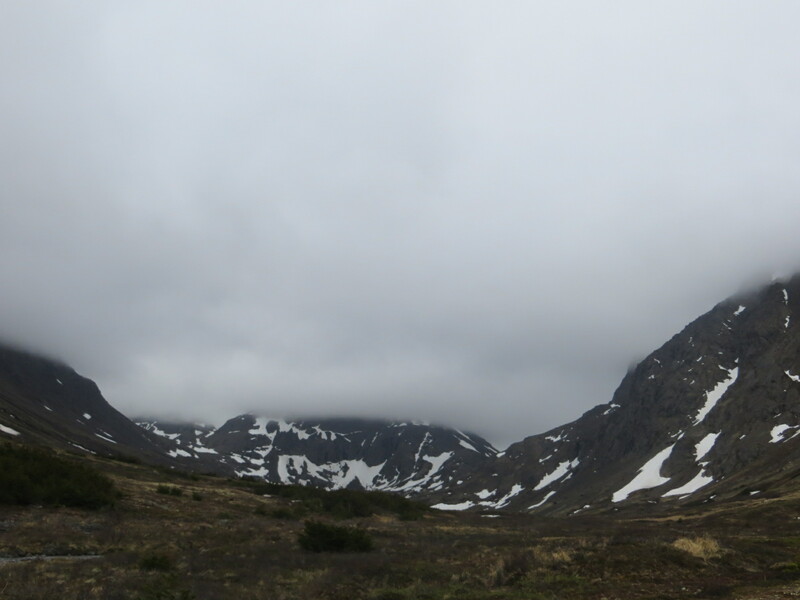 There was no path, just a sheer steep rocky slope, and for the first time, my legs felt a bit shaky with uncertainty. 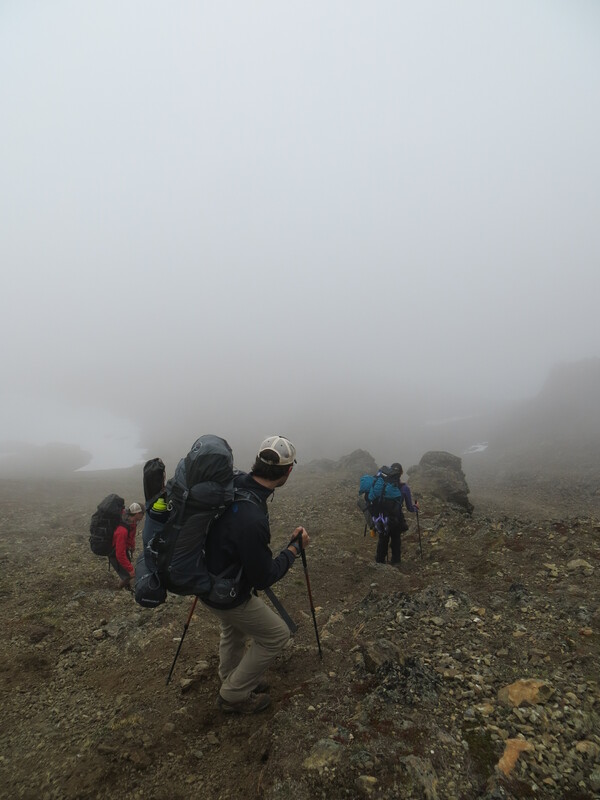 It felt crazy to even attempt to do this with an overloaded and ungainly backpack, but there was something magical about the group energy and the quiet reassurance and competence of our guides. 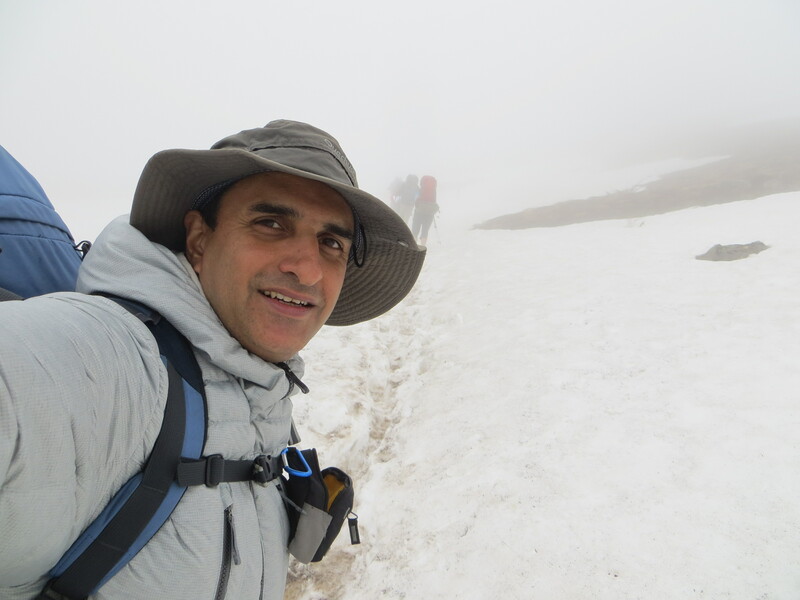 Within a few minutes of planning, we were well on our way down, sliding a few metres each time with rocks and stones slipping below us, digging our trekking poles into the ground firmly with each nervous step. 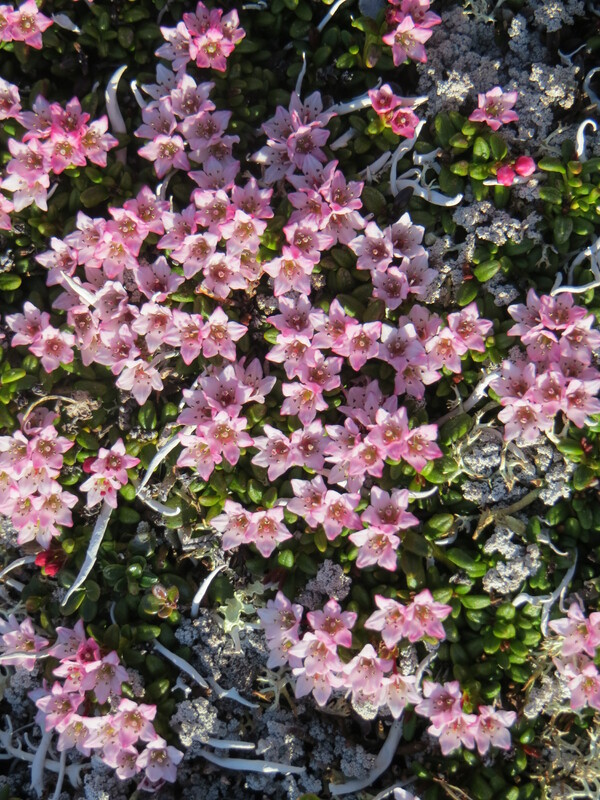 An hour later, after sidehilling the steep descent and foot deep snow stretches, we had descended and traversed 1000 ft to the wide open Snowhawk valley of snow, moss campion flowers and all varieties of tundra lichen. It took us another hour of trekking to reach our campsite – Lake Tanaina at the base of Tanaina Peak. The lake is surreal and like a mirror. Camping by its side was a dream come true with its banks covered in a carpet of yellow poppies, and it was still and silent. In the silence, one could only hear the soft wind and the songs of distant birds. The lake had a small flock of Harlequin ducks. Majestic and endowed with deep colors of gray and blue with white strip and it looked hauntingly beautiful with each passing hour. The sun which was now to our south, stayed in the evening sky for a long time, its ray glinting off the snow and the peaks, that reflected with clarity of a golden light on the lake.